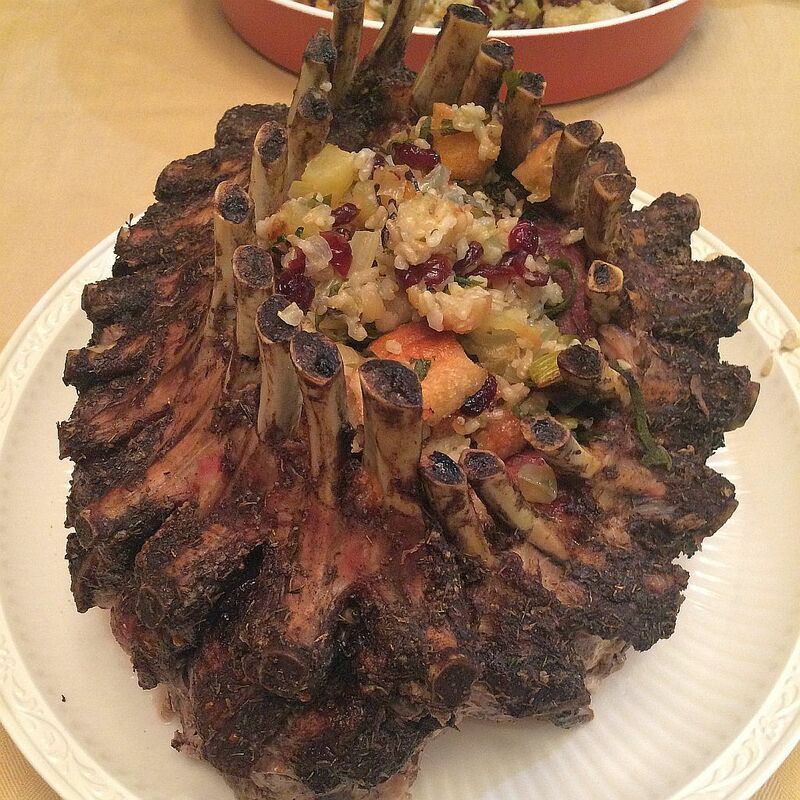 Crown Roast of Pork with Wild Rice, Apple and Dried Cranberry Stuffing. This year we splurged on our Christmas Eve main course and had a local market put together a crown roast of pork. Their minimum size was larger than we needed however it made for an impressive center piece on our holiday table. The crown roast is formed from two regular bone-in pork loins. The butcher removed the chine bone, cleans up the tips of the ribs and formed the crown with butcher twine. I chose to roast it without stuffing, adding a separately baked stuffing once the roast was sitting on the serving platter. This week we had a ‘canned good apocalypse pot luck’. The guidelines were that guests we asked to bring any combination of canned foods to help make a meal (or maybe just a mess). While they could mix canned goods together the only “extra” ingredient allowed is water. Cooking via stovetop, oven or microwave was encouraged ’cause raw canned goods are kind of nasty. Or they could cook their tasty canned good offering at home and bring it along pot-luck style. The menu this week starts with fish tacos for our friend Joe whose birthday was the next day. We add in other taco fillings for those who aren’t hip to the wonder of fish tacos. For the past 8 years or so we’ve had a few friends over on Christmas Eve. We cook something little outside our comfort zone, the little one gets to open a present or two and we celebrate as one should, with family. 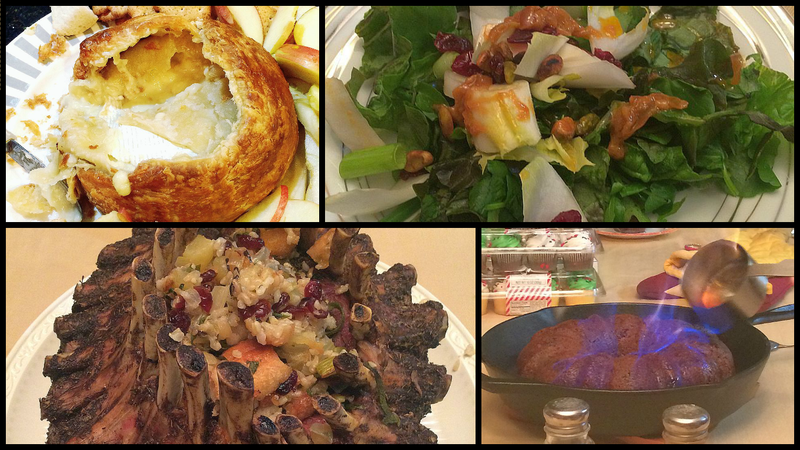 Here’s a few pictures from last night’s menu. Homemade Fruitcake flamed with brandy. Optional whipped cream. Couscous is just about the simplest side dish you can make. If you can boil water then you can make couscous. It can be customized in dozens, maybe hundreds of ways. I get amused when I walk down the aisle in the grocery story and see the section with couscous mixes. These mixes add some extra flavoring (and a heap of sodium) in exchange for doubling the cost of the base ingredient. Free yourself from the preboxed couscous mix; it’s so easy. By the way, don’t confuse couscous with Israeli (or pearl) couscous. Couscous is made from semolina and water and, uncooked, looks a bit like course sand while Israeli couscous looks a bit like those hard white balls they decorate cakes with and is more akin to pasta. I have a recipe using Israeli couscous elsewhere on this site if you are interested. 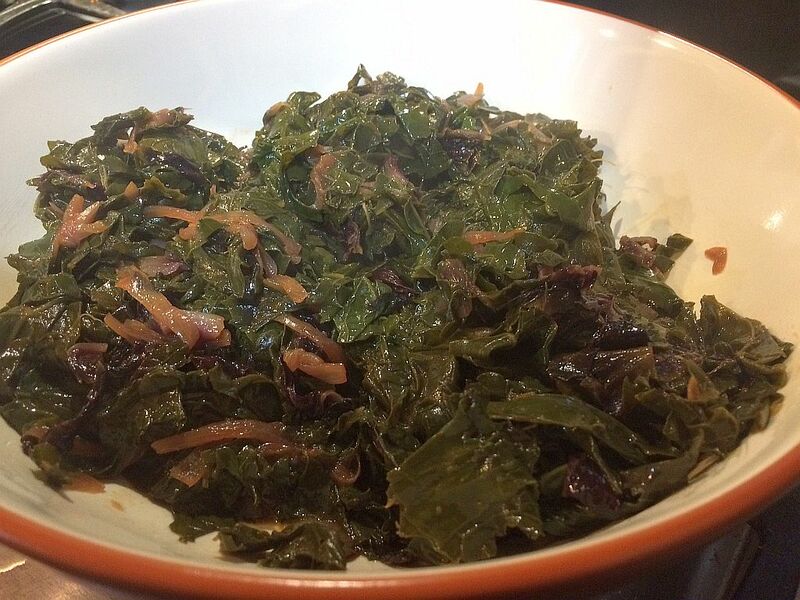 I’m surprised I haven’t added a recipe like this yet given the frequency that I make braised greens of some type. We belonged to a CSA in 2011 and with it came an abundance of leafy greens I had never tried except in the “baby” form via salads at restaurants. Through a bit of cookbook and web surfing we came up with several uses for whatever leafy greenness the CSA threw at us, braising being the chief one. Smaller, for us, gathering this week so I was able to make use of one of my favorite appliances, the slow cooker. I spent 10, maybe 15, minutes on the prep for the main dish, tossed it all in the slow cooker and walked away to do other things. Ted’s co-worker provided the radicchio and the kale came from the food co-op to which we belong.